During his 31 years with the Kansas City Fire Department, George C. Hale became famous for his dedication. He expanded the department, travelled the world promoting his profession, and invented several life-saving devices. But it was after his retirement in 1902 that he became a significant – if largely forgotten – figure in the development of early moviegoing. At this point, filmmakers were already attempting to make their work more “realistic,” photographing hot-air balloon rides and ships’ journeys to exhibit in specially-designed theaters. In England, a popular attraction involved mounting cameras on the cowcatchers of moving trains, so audiences could enjoy a “phantom ride” on the rails. 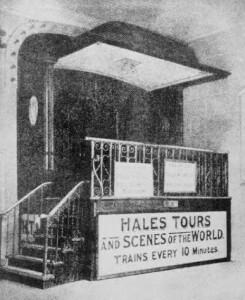 In 1904, Hale partnered with inventor William J. Keefe, Judge Fred W. Gifford, and Gifford’s son, Ward, to create what became known as Hale’s Tours and Scenes of the World. Combining the phantom ride concept with the idea of specially-built venues, Hale and his partners developed a system in which audiences boarded an actual train car, which moved on a short track before coupling with a stationary car. The film, usually of a ride through some scenic distant location, was projected at the front, while the car itself was manipulated to mimic the physical sensation of a train journey (complete with rushing wind effects). It even had the capacity for rear projection, although this doesn’t seem to have been used often. As the tours became more popular, the design simplified, with most shows taking place solely in the stationary car. Locally, Hale’s Tours played at the old Electric Park, usually to sold-out crowds, and they enjoyed similar popularity all over North America. By 1906, there were exhibitions going on worldwide. With such rapid success came an equally rapid downfall. The market became saturated with Hale’s Tours and various knockoffs, and it became increasingly difficult to find new material to satisfy the public. As the novelty wore off, so did box office, and the programs were all but defunct by the 1910s. Despite their decline, Hale’s Tours had an enormous impact on the film industry, which continues to this day. Pioneers like Adolph Zukor and Sam Warner were involved in the programs’ exhibition, which helped them build the careers that would eventually take them to the top in Hollywood. As for Hale, he left the business and enjoyed a comfortable retirement in Kansas City until his death in 1923, probably never realizing how influential his work was. Anytime moviegoers are immersed in a new experience – through digital sound or 3-D or rumbling theatre seats – it’s a testament to people like George Hale and his remarkable tours of the world. In-depth article on Hale’s Tours, with technical information. A rare photo of audiences viewing a Hale film.